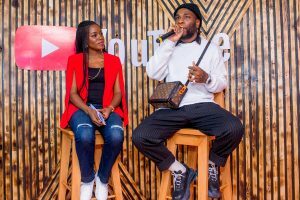 On Tuesday, I attended Youtube’s launch/premiere of its Artist Spotlight Series featuring Burna Boy. As I posted the press release earlier in the day before heading out to the event, I didn’t know what to expect. 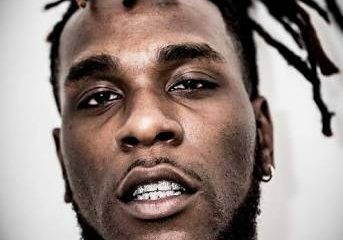 Expect in terms of Burna Boy’s personality which I was very curious about because I am not one to believe the personas created for celebrities by the media . I had seen his videos but hadn’t watched a lot of interviews, mainly because I didn’t go out of my way to. 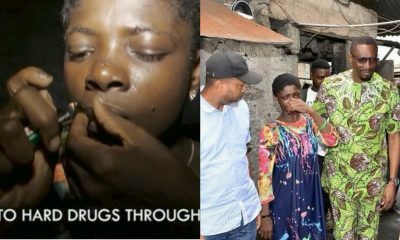 However, As I visited Youtube to watch the teaser of his documentary, my mind flashed back to my first close encounter with his remarkable talent, couple of years ago when Instagram first launched its live video feature. 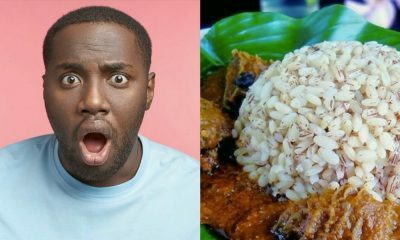 On that occasion, I watched as Damini Ogulu also known as OluwaBurna freestyled for hours on end to beats from the 90’s. 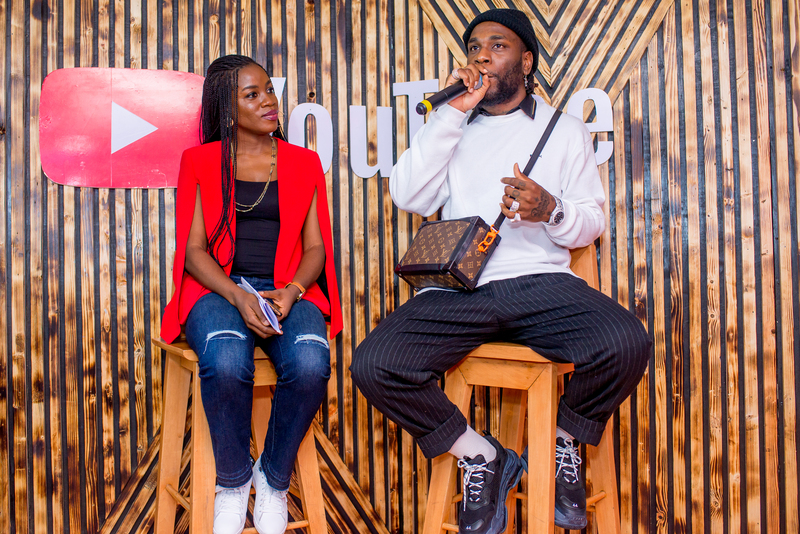 I remember this encounter vividly because I accidentally stumbled on his live video at a time when many Nigerian celebrities were testing out excitedly the newly released feature that allowed them real time interaction with their fans. But somehow, I ended up spending two hours of my very valuable time tuned to his freestyle session, which was captivating as it was entertaining. I said impatiently to the guy at the bar making me a drink, who was more interested in showing off his mixing skills, and seemed very unperturbed by the fact that the star of the evening had just arrived. As waited for another minute, trying to record his walk to the stage where he was to seat for the brief Q & A session, I tried to observe his initial body language, even as I checked the time to see that we had waited over two hours for his arrival. One of my friend’s Miss Techy(Nigeria’s No 1 Female Tech YouTuber) asked while we waited for him earlier. “They say he is, but is stuck in traffic,” I answered feeling very indifferent about the wait even as I munched on a well seasoned piece of meat I had just chewed off a stick it was impaled upon. With Google, it’s always a wellspring of refreshments and Tuesday was no different, with top notch finger foods, cocktails and champagne in abundance. 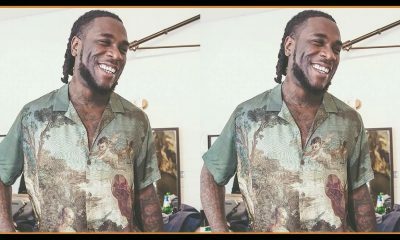 So despite been warned just a few minutes prior on Whatsapp by a colleague -who replied to my status- that the last time he was to interview Burna he took forever to show up, I wasn’t feeling shirty in the least. And I suspect it was same for many of my colleagues too. Instead, I enjoyed the food, engaged in some persiflage, and used the time to post updates from the event on social media. After Mr showoff finally handed me my drink, I quickly walked to my seat, but found it had been taken by his Mum. His Mum who is his manager, one of the key people he credits for his success and growth. 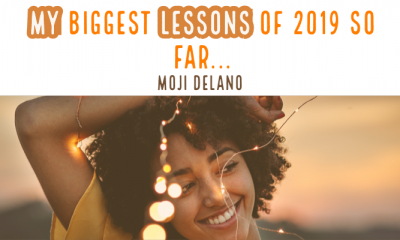 “Ma’am, you’re…” I was about to say but was quickly interrupted by Shawttynatt, a good friend and colleague who signalled that I come to the other end of the row, where another colleague Demola Expoze was going to vacate his seat for me. What I was going to say to her however was that a seat was reserved for her in front. But since she appeared comfortably seated in my seat, I proceeded to seat where I was going to show her, the first seat on the first row, just opposite her son. 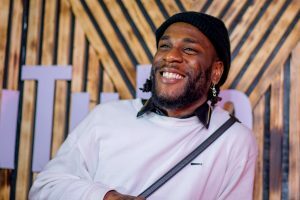 Burna Boy’s relationship with his Mum is one I admire and respect immensely because of the close relationship I have with my Mum. 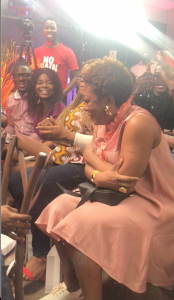 So when at a point during the interview he was asked what kept him grounded and he said keeping his family around him, especially his mum, I awwwned warmly and looked back at my seat towards Mrs Bose Ogulu. She wove shyly and gave a smile that showed how proud of him she was. Dressed in a pearl pink dress, beautiful white wedged shoes that was a hybrid of brogues and sandals, accessorized with spiral gold earrings and a statement band like gold bangle, she looked every each the Momager her son spoke proudly and lovingly about. He hair was golden brown, worn in short dread locks, and her make up minimal and beautiful. I later took a picture with her and was tempted to ask if I could interview her sometime but decided against it, because she had quite a number of people around her vying for her attention. Maybe next time. As I looked back on stage and recorded the question and answer session with Burna, I tried to read in between the lines and really take in his personality keenly. The first word that comes to my mind now and describes him as I think back is ‘chilled’. He seemed very comfortable and relaxed as he answered the questions asked. I also felt sincerity in the way he spoke. He answered the questions sincerely without trying to be politically correct. He laughed a lot in between answering the questions too. The intermittent laughter communicated to me that he didn’t take himself too seriously and I got the feeling that this 27 year old just wanted to live a life that was simple and happy surrounded by his loved ones, doing what he loved best-MUSIC. “I never had any dreams of being at the top of anything. 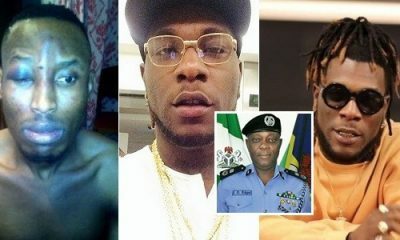 I just wanted to make music that appealed to people, that thought the same way I did,” he said while answering a question about dealing with his astonishing success and joining Nigeria’s top tier artists( Wizkid and Davido). “I didn’t think I was going to have a fan base that was going to be this big, I just thought it was going to be a selected few- but somehow it turned out to be what it is now” he continued as he interjected with short bouts of laughter. “I make music for me first not for any type of accolade or materialistic gain. That’s not my first priority…this is just what I was born to do,” he added. This to me appears to be someone who set out to do music focusing on the process, his art, and the consequence that resulted from it being his world wide acclaim and acceptance. He also spoke about how Youtube helped his music and showcased his talent to the world. He called it his biggest and easiest channel of output for his music which he never had to pay for, yet went very far in terms of taking his music to the farthest corners of the world. 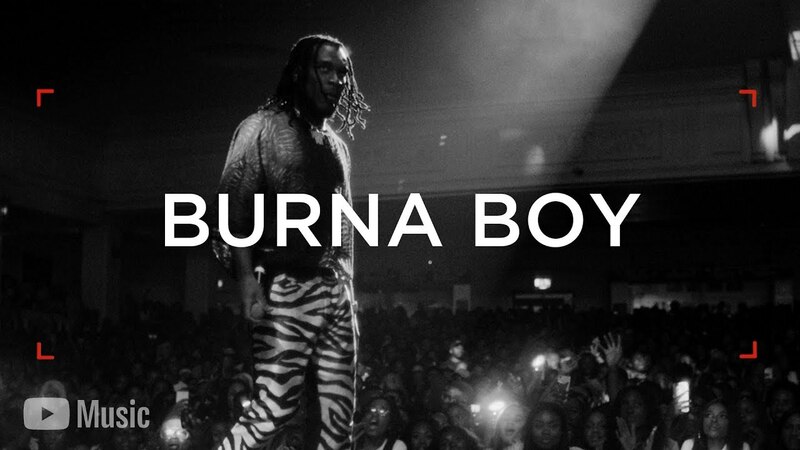 In the 18 minutes Artist Spotlight documentary premiered before his arrival, his grandfather who used to be late afrobeat Legend Fela Anikulapo Kuti‘s manager mentioned how Burna used listen to Fela’s music and that of other legends for hours un-end. 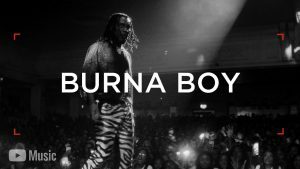 It is therefore no surprise that we see more and more of Fela’s influence in Burna Boy- from his stage outfit to his persona, and his sound. And even as he comes more into his own, his unique voice and style has carved a special niche for him in the global music scene, result of which will see him perform at global American music festival Coachella later this year, and gradually, over time transcend him from artist to legend, in his own right. He may have been influenced by Fela, but this young man, is not in anyway going to remain in his shadow, at least not for long. 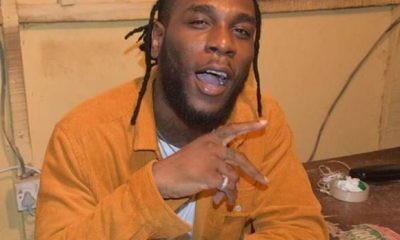 From the documentary, and how he spoke about his passion, it was evident that Burna boy lives for music, breathes music, epitomizes music. His remarkable talent told to his mum by his teacher who was convinced he would be a star many years ago no longer needs special ears to detect; today, an average music lover can attest to his musical prowess. His sound is that which embodies the saying that ‘music is a universal language’. If he continues on this path focused on the quality of his music rather than the consequence and remains consistent, legendary status for him will not only be assured, but his foot prints will be left in the sands of time, such that very few if any will be able to fit into it, in generations to come.